Another busy news month, and here we are with another U.S. news-related Google search visibility index, this time for June 2017. Just last month, we highlighted the top publishers in overall Google News search visibility for January-May 2017. And we took a look back at the top publishers in Google News U.S. for 2016 earlier this year. Now, we used the News Dashboard SEO tool to look at which news websites claimed top spots in search visibility for June 1-30 in a number of Google News-related ranking types. We focused only on imported keywords – Google News Topics and Google News Related. In addition to analysis of past performance, the News Dashboard can also provide tips on Google News optimization for publishers. Due to the redesign of Google News that happened in June 2017, the News Dashboard had a few periods at the end of the month that prevented data from being imported for some of the measurements. However, as is key every time Google rolls out a new change that can affect your SEO (or overall website or tool), our developers made short work of getting everything in order. You can read about some of the new features of the redesigned Google News from Ars Technica. We’ll see the digital publishers who showed up the most in Mobile Visibility Overall, Mobile AMP Carousels, Google News and Google News Boxes. We’ll also look at the top 20 Google News topics for the month. This KPI Dashboard report measures visibility in News Box Headline, News Box Text, News Box Carousel, Publisher Carousel and Newsticker. Everyone showed fairly steady performance over the month. Search visibility in Mobile Visibility Overall was a tight race for the Top 5 news publishers in June 2017. Compared with the January-May Top 5, CNN and the Washington Post overtook USA TODAY, while Fox News replaced Yahoo, and the New York Times moved down one rung. As we’ve seen in multiple analyses over the last few weeks, CNN’s mobile search visibility is skyrocketing. Then we narrowed the mobile analysis down to just AMP Carousels – a subset of mobile News Carousels that only include Accelerated Mobile Pages, which Google has said it favors. CNN takes a steep drop here, while Time enters the pack in place of the Times. Mobile AMP Carousels brings some similar Top 5 competitors for the June 2017 U.S. index. We see positive movement from the Post and Fox News in June compared with the last six months, while USA TODAY and CNN each slip a spot, and Time kicks out Yahoo – which lost all of its Top 5 spots in the index watch. Moving our attention over to desktop and diving into Google News, the Top 5 group is much more spread out across search visibility percentages, with the Post leaps and bounds ahead of the closest competitor. It’s interesting to note that there is one British publisher in each of the desktop reports for the June index watch. Traditional news publishers tend to rank well for desktop Google News search visibility when we analyze the U.S. search index. Compared with January-May, the Top 4 remains the same, with USA TODAY dropping out and being replaced by the lone Brit, Reuters. Much like the Washington Post is far and away the leader for U.S. desktop Google News search visibility in June 2017, CNN takes the lead for desktop Google News Boxes. Everyone switched around here except for ESPN compared with the last six months. CNN overtook the Times, showing its increasing visibility bleeds into desktop as well as mobile. The Guardian and the Post kicked out USA TODAY and Yahoo, respectively. It’s interesting to consider what looks like USA TODAY’s increased attention to mobile ahead of desktop visibility. 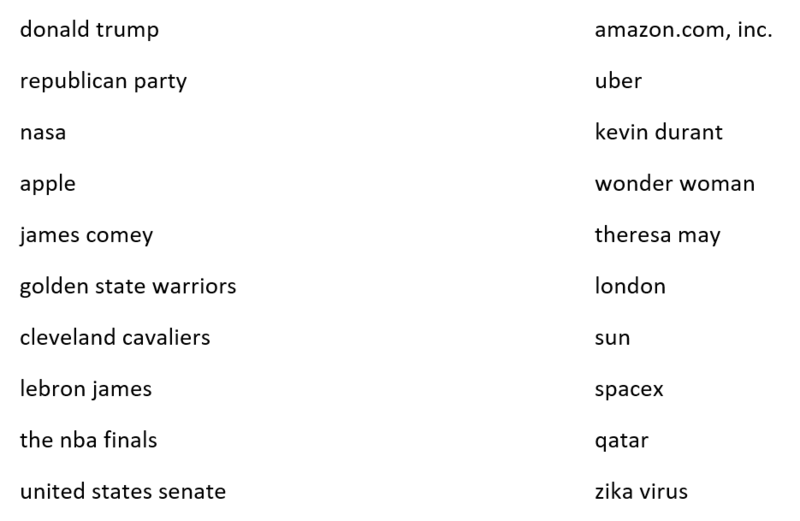 A mix of politics, sports, technology, science, health and world news made up the top Google News topics. In a fairly non-shocking turn of events, Donald Trump continues to be the top Google News Topic into June. Sports, politics and business all make a good showing – along with a few more global topics, possibly leading to the inclusion of the British publishers in our earlier reports in the U.S. index. Among the other topics that make a repeat appearance from the last six months: NASA, SpaceX, Republican Party, Cleveland Cavaliers, Uber, zika virus and Apple. The Washington Post and CNN appear in all four. The New York Times appeared in three, missing out on Mobile AMP Carousels. USA TODAY, Fox News and ESPN landed in two reports each. Time and Reuters made it into one report each. Compared with the last six months, CNN repeated its performance in June, while the Post jumped from three reports to all four. 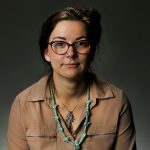 The Times remained at three; USA TODAY declined from all four to two; ESPN repeated its performance in two; and Fox News increased from one report to two. If you’re among the winning publishers for June – or if you’d like to join that pack by analyzing your current search visibility in Google News-related ranking types – reach out and sign up for a demo to learn more about the News Dashboard. We hope this report on SEO for news publishers proves interesting.